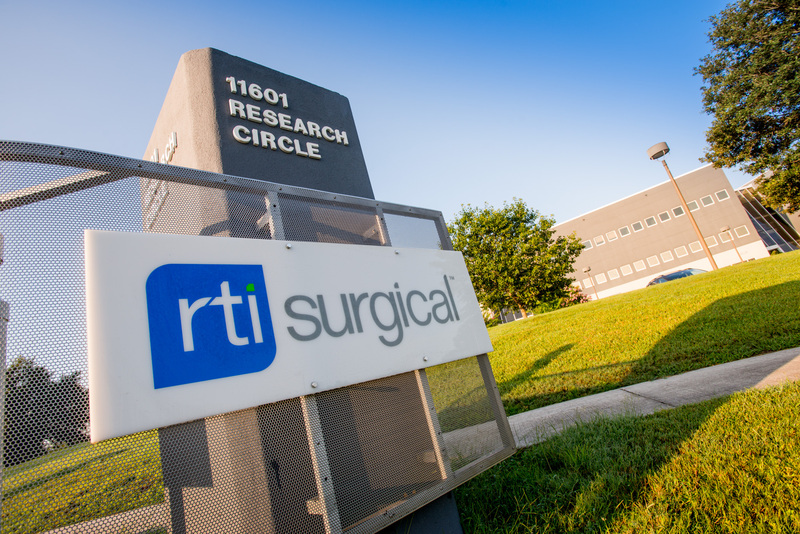 RTI Surgical® Features Next-Generation Spine Implant Technologies at NASS 2018 - RTI Surgical Holdings, Inc.
LOS ANGELES – September 26, 2018 – RTI Surgical, Inc. (Nasdaq: RTIX), a global surgical implant company, will showcase research reinforcing the strength of its spine portfolio, notably the Fortilink® IBF series featuring TETRAfuse® 3D Technology, at the North American Spine Society’s (NASS) 33rd Annual Meeting in Los Angeles, September 26-29. Additionally, RTI will feature its full line of hardware, interbody and orthobiologic offerings at Booth #1523, including its newest orthobiologic options, ViBone® Viable Bone Matrix and the next generation of the nanOss® Advanced Bone Graft Substitute (ABGS) series, nanOss® 3D Plus™ ABGS. In the same session, Dean E. Smith, MD, from the Spine Center in El Paso, Texas, will present findings from an in vitro evaluation and a retrospective study of clinical outcomes in patients undergoing lumbar and cervical fusion using ViBone. The in vitro evaluation demonstrated better cell health in ViBone, including lower apoptotic activity, better cellular proliferation, as well as greater production of osteogenic markers, than control viable bone matrix. ViBone: RTI recently signed an agreement under which Aziyo® Biologics, Inc., will provide ViBone to RTI for exclusive distribution in the U.S. ViBone is a viable bone product designed to perform and handle more closely to autograft in a variety of orthopedic procedures. nanOss 3D Plus ABGS: RTI launched nanOss 3D Plus ABGS, a new addition to its nanOss ABGS series, designed with innovative technology and supported by clinical results,[ii] to provide optimal handling properties for a variety of orthopedic procedures. The SImmetry® System: RTI is pleased to share the final patient has been recruited in the ongoing EVoluSIon Clinical Study. EVoluSIon is evaluating the impact of the SImmetry System on sacroiliac (SI) joint fusion and pain reduction in patients with SI joint dysfunction who have not gained relief from conservative care. A total of 250 patients are participating in the trial across 23 sites. RTI plans to share the latest outcomes analysis in early 2019. Fortilink-C, -TS, -L IBF Systems: RTI intends to initiate patient enrollment later this year for a prospective, multi-center post-market evaluation of safety and performance of the Fortilink-C, -TS, and -L IBF Systems with TETRAfuse 3D Technology. The study, titled FORTE: Clinical Evaluation of Fortilink TETRAfuse Interbody Fusion Device in Subjects with Degenerative Disc Disease, aims to enroll up to 150 patients at up to 25 sites. The study will assess radiographic evidence of fusion assessed by an independent core laboratory, pain reduction, and procedural and long-term success of the Fortilink C, -TS, and -L IBF Systems. [i] Data on file at RTI Surgical, Inc. Performance data from animal studies may not be representative of performance in humans. [ii] Data on file at RTI Surgical, Inc.